The water tank is made of stainless steel 316 or 314. Its internal surface is polished and its surface roughness is Ra0.4μm. It can be chosen according to local water quality, sanitary manhole, liquid indicator and more. 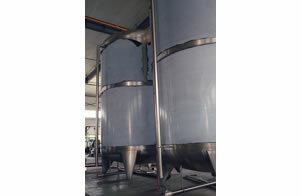 Water tank has wide application in processing industry of food and beverage. This equipment is a kind of stainless steel water tank with volume of 3M3. It is fitted with air respirator, manhole and liquid indicator. Founded in 2006, our company is a leading manufacturer and supplier of water tank in China. Here in Topling, we mainly offer pure water and mineral water filling line, juice filling production line, carbonated drink filling line and related equipments including rinsing filling capping machine, coders (shrink-wrappers), and other related machines. We offer installing and debugging services of our devices and staff training for factories abroad and OEM service. For more guides of water tank, please contact us.